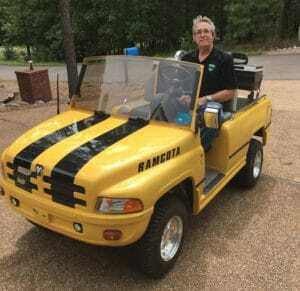 What year is my cushman truckster? The answer is 1952 to 2002 depending on the serial plate, usually located by the handbrake. I have included a chart below for each years specific models. First, locate the serial number. 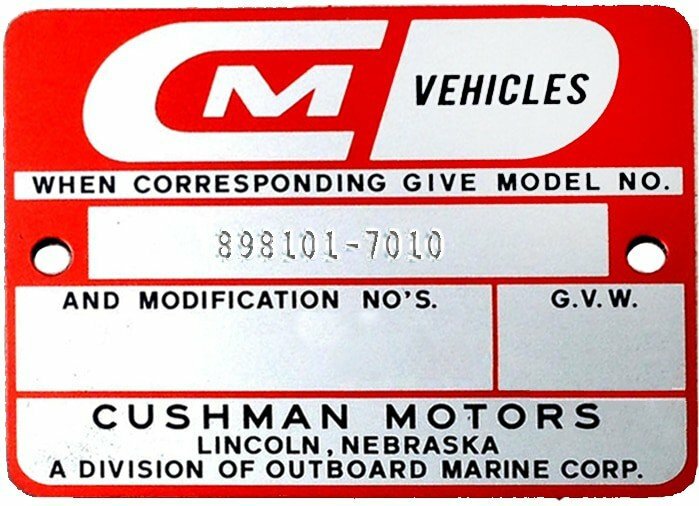 The Cushman serial number should be six numbers, then a dash, followed by four more numbers, such as 898101-7010. Trucksters often have their serial numbers on a metal plate (See the image above) on the dash near the emergency brake. If not located there, look under the driver’s side seat, and on the metal side rail below the floorboard on the driver’s side. Look at the two numbers following the dash. The two digits following the dash represent the year the Truckster was produced. All Trucksters were produced before 2000; so a model number of 898101-7010 would mean that the Truckster was produced in 1970. Finally, if the model is not in the chart below, you can contact Cushman directly by email at cushman@textron.com or at the customer service line 800-774-3946. They can provide information about how to find a serial number or if you found the number but can’t decipher it, they can tell you how to determine a production date without a serial number. 898635 1992 Spray Truckster 27 HP,liquid cooled, 3-Wheel 160 gal. 898535 1993 Spray Truckster 22 HP, 3-Wheel 160 gal. 898635 1993 Spray Truckster 27 HP,liquid cooled, 3-Wheel 160 gal. The liquid-cooled 327 engine, I take it. I haven’t gotten as far as building up the site to include the Turf Trucksters yet, but I think I have something you can use…sending it your way. Usually the Model Number is found under the seat to the driver side of the shift lever console. The number is stamped into a plate riveted to the console. Other than that, we would need to compare it to lubrication location charts, model description, etc. I am sending a pdf with model, year, and description to try to match it to, i.e. 3 or 4 wheel, dump bed or pickup…the manual number can be matched to that. Under model type 898611 and leave the other blank…there is an exploded view of all the parts available.